We were honoured to have Paul McGann come to visit our Academy on Monday 30th April. Paul grew up with his brothers and sister just a few minutes up the road from our school. When our Chaplain Phil Johnson met Paul at Comic Con he asked if he would come and visit our school and revisit the area he grew up in and we were delighted when Paul emailed to say he could visit us. After meeting Mrs Greenough, Paul was welcomed by our Academy Samba band with a stunning performance of an improvised piece with a Dr Who theme. After that he moved on to the Drama department to see our Drama Club perform their play ‘Talkin’ about my Education’ which was written for the NOW festival. The play highlights mental health for teenagers and Paul was very impressed with the performance. 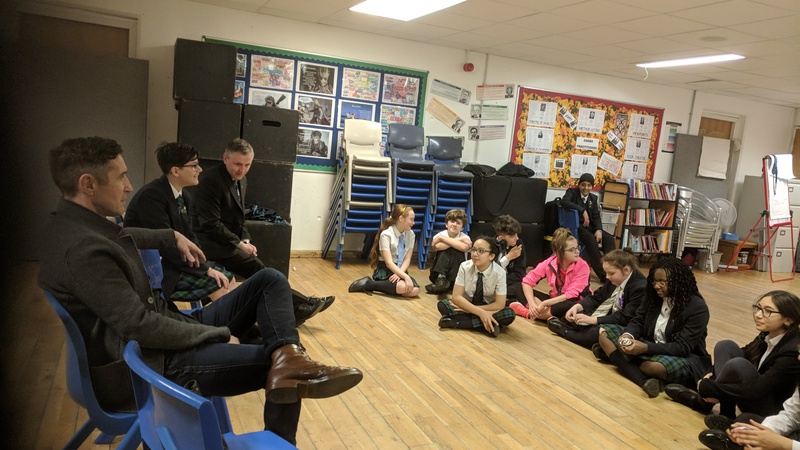 He talked about his acting career and did a quick Q & A session with them before being whisked off to the chapel for another session with some older students. Before ending his visit with a performance from MODE of The Jackson Five’s “I Want You Back” he squeezed in a quick visit to the library to see our Dr Who section.